Sign Up To Our Newsletter. PTO GEARBOX & PUMP ASSEMBLIES. 3/8 MONOBLOCK VALVES 40 L/MIN. 3/8 MONOBLOCk VALVES 45 L/MIN. 1/4 MONOBLOCK VALVES 20 L/MIN. 1/2 MONOBLOCK VALVES 45 L/MIN. 1/2 MONOBLOCK VALVES 70 L/MIN. 1/2 MONOBLOCK VALVES 90 L/MIN. 1 MONOBLOCK VALVES 160 L/MIN. 3/8 SLICE VALVES 45 L/MIN. 1/2 SLICE VALVES 60 L/MIN. 1/2 SLICE VALVES 80 L/MIN. 3/4 SLICE VALVES 120 L/MIN. 1 SLICE VALVES 240 L/MIN. 3 PORT FLOW CONTROL VALVES. Double Acting Fixed Pin Holes. Double Acting Turn Over Plough. Top Link Fixed Mount With DPOC. Top Link Rapid Hook With DPOC. Top Link Rapid Hook DPOC&Hose. 12 VOLT DC POWER PACKS. 24 VOLT DC POWER PACKS. 110 VOLT AC POWER PACKS. 240 VOLT AC POWER PACKS. 415 VOLT AC POWER PACKS. ELECTRIC MOTOR & GEAR PUMP SET. ET-ELECTRIC DC MOTOR PUMP SETS. HATZ DIESEL ENGINE POWER PACKS. TWO STAGE HI-LOW GEAR PUMP KIT. HYD GEAR PUMP ADAPTOR KITS. 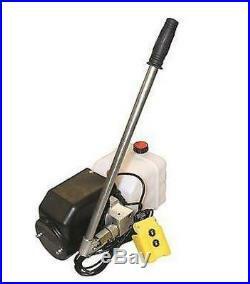 Flowfit 24V DC Single Acting Hydraulic Power Pack, 8L Tank & Hand pump ZZ005133. Flowfit 24V DC Single Acting Hydraulic Power Pack with 8L Tank and Hand Pump. The Flowfit 24V DC single acting power pack is a compact and quite unit, able to deliver a flow rate of up to 5 litres a minute at 160 bar. The compact design includes lowering solenoid valve, relief valve and flow controller mounted within the housing and comes complete with detachable two button pendent and 10cc per stroke hand pump in case of power failure and 8 litre plastic tank as standard. Power pack package to operate a single acting cylinder with detachable two button pendent. 1.6kw 24V DC electric motor with relay and plastic motor cover. Power pack complete with suction strainer, return oil conveyor and filler breather. Relief valve set at 160 bar but adjustable from 40-200 bar as standard. Adjustable flow control for cylinder decent control. 24V DC let down valve, relief and p line check. 2 button detachable pendent on a 4 metre lead. The Flowfit 24VDC Single Acting power pack will require a high capacity battery and a suitable in-line fuse for normal operation. The motor is designed for intermittent use (S3) which is defined as a sequence of identical cycles of 10 minute duration. The cycle comprises a period of on-load (td) operation in which the motor may reach its maximum permitted temperature, followed by an off-load (tm) of time, insufficient for the motor to return to ambient temperature. The value of S3 on this motor equates to 7% or 42 seconds of on-load operation in a ten minute period. Is a fluid power component, assembly, distribution and manufacturing company specialising in the supply of hydraulic components and hydraulic systems. The Flowfit brand provides numerous hydraulic products and services to over 50,000 customers worldwide. We work closely with our suppliers having exclusive direct deals with many hydraulic component manufacturers which allows us to offer with our original equipment manufacturers, distributors and resellers who constantly require and source the most up to date hydraulic components and solutions. Hatz : Diesel engines single cylinder up to 4 cylinder, power ranges from 1.8HP to 75HP silent packs also available on the larger engines. Mintor : production of metal plugs and level indicators with a wide range of applications - Loncin : Petrol engines single cylinder 4 stroke up to 15HP also available upon request twin cylinder 20HP with electric start. Gates : advanced power transmission and fluid transfer solutions by engineering products. Highly recommended is our own Flowfit hydraulic product range, covering hydraulic power units up to 37kw, hydraulic hand pumps, hydraulic motors, hydraulic cartridge valves, bell housings and drive couplings, PTO gearboxes, electromagnetic and mechanical clutches, tanks and numerous hydraulic accessories. Alongside which we now offer complete kits such as trailer and tipper kits, pto gearbox and pump assemblies, log splitter kits, hydraulic tank assemblies, motor pump sets as well as petrol engine and pump assemblies. Our UK headquarters are in the beautiful South Shropshire town of Ludlow. We will do the best we can to meet and exceed your expectations. We are proud to be a QMS ISO 9002 Registered Firm. All orders placed before 4pm will be dispatched that same day. We are not responsible for any wrong or undeliverable addresses. Your rights to return goods are protected under the Statutory Instrument 2000 No. Parys Road Ludlow Business Park. Mon - Thurs: 8.30am - 5.00pm Fri & Sat: 8.00am - 4pm Sun: Closed. You may also be interested in. Flowfit 24V DC Single Acting Hydraulic Power pack with 4.5L Tank ZZ003820. Flowfit 24V DC Double Acting Hydraulic Power pack with 4.5L ZZ004236. Flowfit 24V DC Double Acting Hydraulic Power pack with 8L ZZ004237. Flowfit 24V DC Single Acting Hydraulic Power pack with 8L Tank ZZ003835. Flowfit 24V DC Double Acting Double Solenoid Hydraulic Power pack 8L ZZ004239. Flowfit 24V DC Double Acting Double Solenoid Hydraulic Power pack 4.5L ZZ004238. Flowfit 24V DC D/Acting D/Solenoid Hydraulic Power pack 4.5L & Hand pump ZZ005141. Flowfit 24V DC Single Acting Hydraulic Power pack, 4.5L Tank & Hand pump ZZ005134. SIGN UP TO OUR NEWSLETTER. Sign up to receive important updates, news and information. Flowfit, Parys Road, Ludlow Business Park, Ludlow, Shropshire, SY8 1XY. The item "Flowfit 24V DC Single Acting Hydraulic Power Pack, 8L Tank & Hand pump ZZ005133" is in sale since Friday, February 7, 2014. This item is in the category "Business, Office & Industrial\Hydraulics, Pneumatics, Pumps & Plumbing\Other Hydraulics & Pneumatics". The seller is "flowfitonline" and is located in GB. This item can be shipped worldwide.